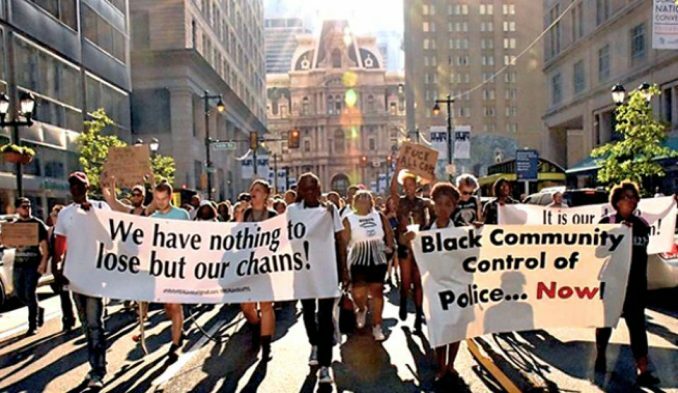 A Black Resistance March in Philadelphia on Feb. 17 to protest police terror in the era of Trump’s law-and-order policies was brutally confronted by Philadelphia police near Temple University campus at the end of the action. When demonstrators attempted to enter Morgan Hall, a symbol of the university’s expanding gentrification of neighboring African-American communities, police pushed back and tried to kettle them using bicycles as weapons. In reaction, protesters then shifted their focus to a Bank of America across the street, at which point the police began to pepper spray protesters. Four protesters were subsequently arrested while several others were injured by the police, who pepper sprayed them at close range, pushed them to the ground and pulled some by their hair. One older woman, who was pepper-sprayed and pushed by police, suffered multiple injuries including a broken nose. Police continued their brutality against activists Feb. 18, when they suddenly arrested seven people who were doing jail solidarity for three of the men initially arrested who were still being held. To cover their mistakes and injuries of fellow officers, Temple University police officer Glen Ehly claimed that demonstrators “sprayed the officers in the face with some kind of chemical irritant like pepper spray.” (The Temple News, Feb. 18) This lie was picked up by mainstream media stations, which made no mention of the injured demonstrators. Some demonstrators who witnessed the confrontation told Workers World that Temple police officers were the first to use the pepper spray. 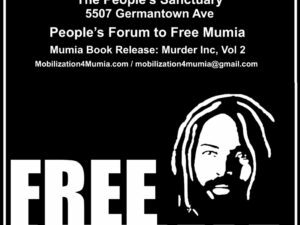 Just before the confrontation, the demonstrators had called out Temple police for covering up the murder of 24-year-old Joyce Quaweay, who was beaten to death by two former Temple University police officers in August 2016. 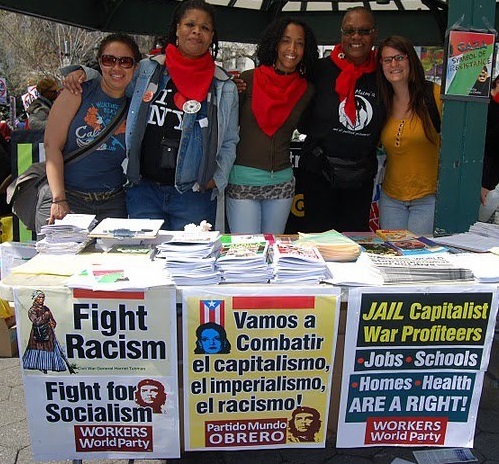 The rally and march organized by the Philadelphia REAL (Racial, Economic and Legal) Justice Coalition started earlier in the afternoon at Thomas Paine Plaza near City Hall in front of a bronze statue of Frank Rizzo, notoriously racist former Philadelphia mayor and police commissioner. Rally organizers seek to have the statue removed. Speakers denounced Philadelphia’s current mayor, Jim Kenney, for backing down on his campaign promise to end the policy of Stop and Frisk. 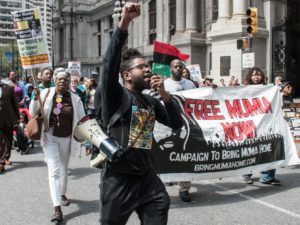 As the march of around 200 people made its way north on Broad Street, it paused outside the school district headquarters, where speakers addressed a crisis of toxic water in West Philadelphia High School. Further north on Broad Street at the site of the Divine Lorraine Hotel, a historic building now being converted to condominiums, others addressed the crisis of gentrification. At Broad and Girard, a U.S. flag was burned as REAL Justice organizer Erica Mines described the flag as a symbol of the long history of U.S. wars and imperialist invasions of other countries. 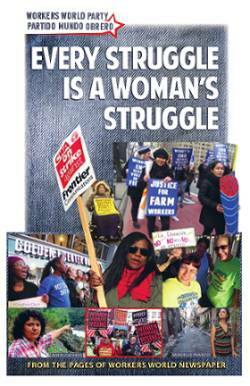 The REAL Justice action was one of hundreds of protests held across the U.S. as part of the Strike4Democracy, under the theme of resistance to the Trump administration.